So the timing of my new camper acquisition didn’t seem too great. I pulled it home on a Tuesday, got sick with a summer cold next day and spent the remainder of the week dragging around the house feeling lazy and yuck, finally got up enough energy to paint part of the exterior (see last post) over the weekend, then left for Philadelphia with the kids. After all the excitement of getting my little Yellowstone I was let down at not being able to work much on it. But then something magical happened! 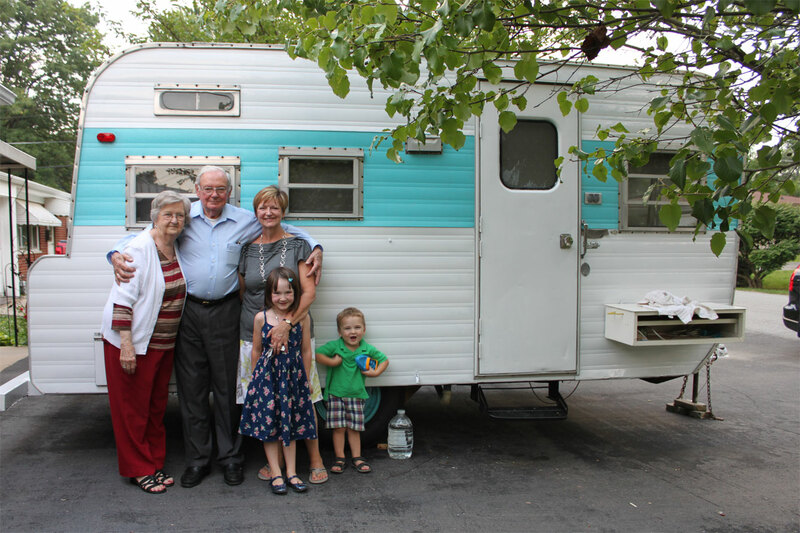 On the day before my trip to Philly my maternal grandparents came by to see the new camper. It turned out that they had also owned a late-60s Yellowstone of about the same size and layout. How fun! Granddad remembered every detail; Mamaw’s fingers couldn’t stop themselves from doing a little cleaning around the kitchenette while they were there looking around. I got the grand idea to leave the camper over at their house during my trip. I could tell Mamaw wanted to scrub it a little and I figured they’d have fun just having it there on site for a few days. So I pulled it over to their house and left it, all dirty and full of miscellaneous supplies, in their driveway and waved goodbye. The kids and I spent a jolly five days visiting friends and family and driving 1400 miles. 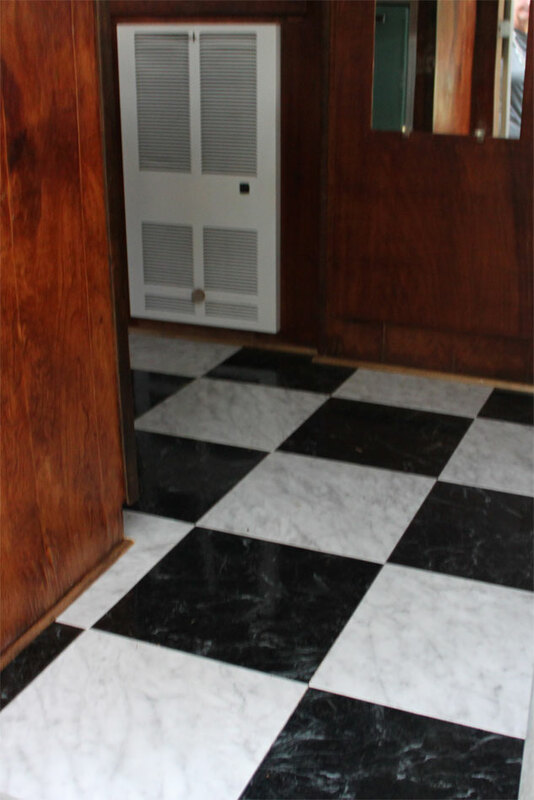 When I left the camper at Mamaw’s the entryway looked like this (above). And when I came back it looked like this! 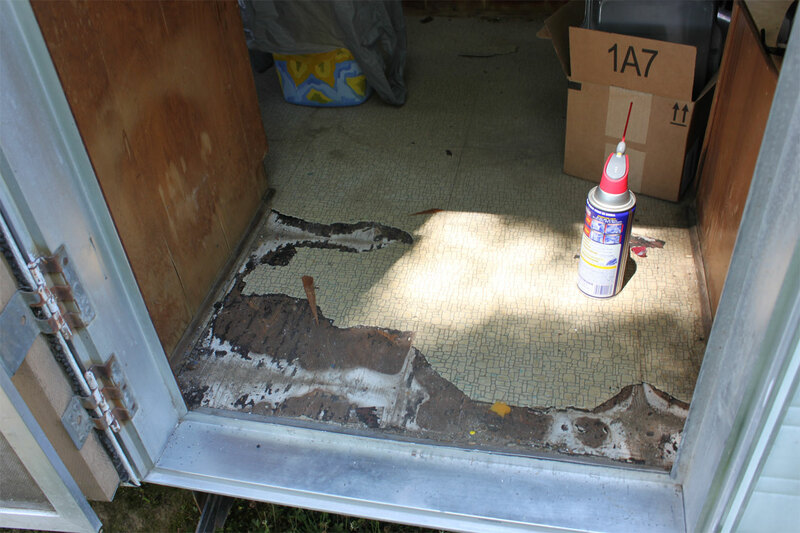 And when I left the back wall (with water damage under the window) looked like this. It turns out that a little more than cleaning went on while the Yellowstone was parked at my grandparents’ house. My mother and her parents (all pictured here with my kids) caught vintage camper fever in my absence. 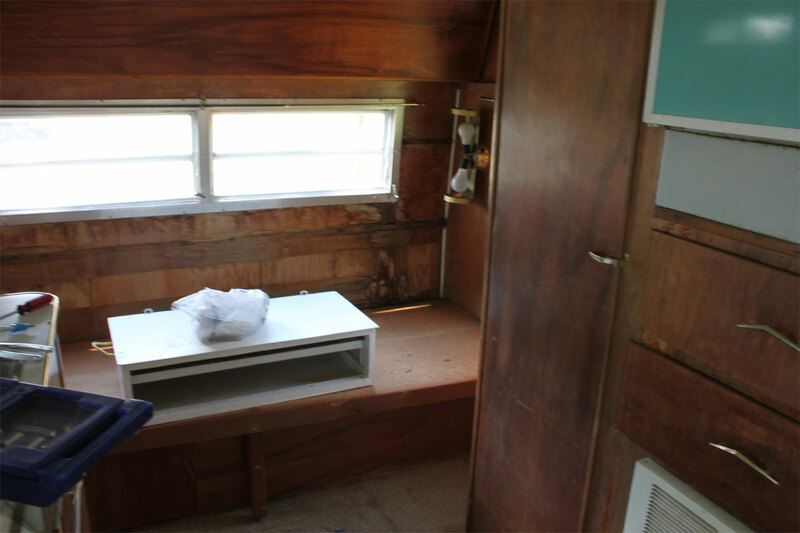 They might have started just cleaning, but they ended up completely refurbishing the interior. Granddad replaced the damaged and missing veneer on the back wall and in other spots, Mamaw cleaned every nook and cranny, together they stained and sealed every surface, stained and rehung all the cabinets with the new hardware I’d left behind, painted the metal parts that needed repainting, and then on the day I drove back across the Pennsylvania Turnpike Mom laid the new floor while Granddad (did I mention that he is 85 years old?) went behind her with the base shoe. Wow! It looks fantastic! It was really fun to see what they’d done, and to savor the idea that my beloved family had such fun on this project while I was gone. It felt like camper Christmas going through it today with all the surprises! I think they all had a great time doing it too and we all enjoyed the big unveiling today. 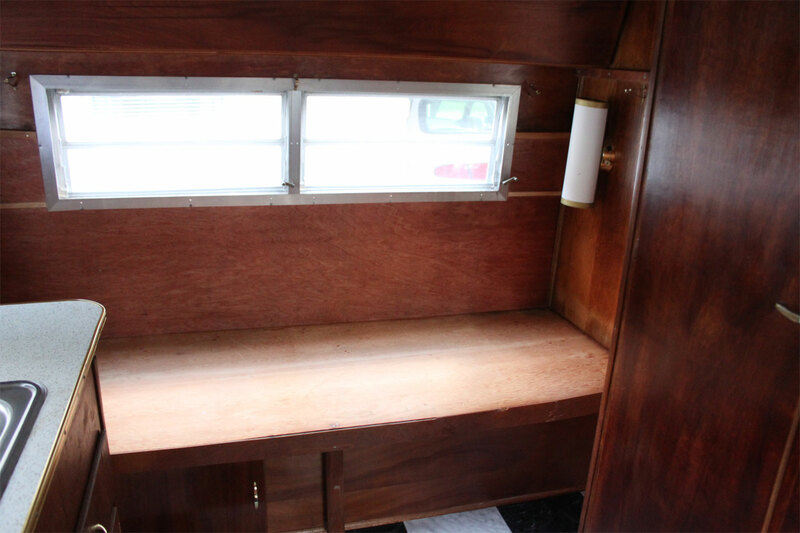 Now I get to pull it back home and finish the exterior paint, and then I’ll be straight onto my very favorite tasks of sewing the new cushions and curtains and outfitting it with all our supplies. I hope I can talk my grandparents into making a little excursion with us once it’s done, even if it’s just a daytime camp-out at a nearby park. Now this is a family business! This is such a lovely story. You have a very special family. I love your van. I aspire to do the same thing one day and redecorate a van with all my handmade goodies. Truly retro.